In 2010, The Lutheran Church—Missouri Synod's Youth Gathering launched a Gathering Grant program out of a portion of the Gathering Offering to help LCMS congregations and related groups implement projects that place youth in leadership roles to reach out to un-churched and marginally-churched youth and encourage young people in their understanding of God’s love. High school youth, under the leadership of their peer, Chelsea Haack, hosted a free, week-long sports camp for a foster care center and trailer park community. Transportation to and from the camp was provided by an adult volunteer. The sports day camp also included a complimentary lunch, Bible for each participant, and opportunities for the campers to grow both athletically and spiritually. After hearing Bob Lenz at the Youth Gathering, Bethany Pauley, from Trinity Lutheran in Holcomb, Kan., wanted her peers at home to hear Lenz's message. 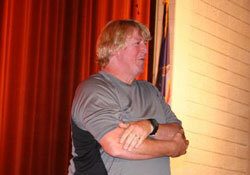 In partnership with Holcomb High and Students Against Destructive Decisions, Pauley organized an event, and more than 750 students heard Lenz’s account of how bullying has affected him and his family while reflecting on how their actions affect others. 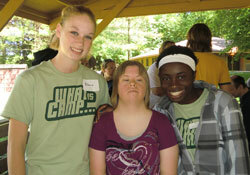 A grant was received by Bethany Pauley from Trinity Lutheran Church in Holcomb, Kan.
High school youth hosted a camp for people with special needs in their community. At the camp, youth from Messiah Lutheran Church in St. Louis, Mo., led participants in crafts, games, singing, and learning Bible stories. Both Messiah’s youth as well as the camps participants were blessed by their time spent together. 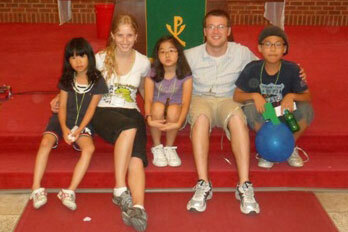 A grant was received by youth at Messiah Lutheran Church in St. Louis, Mo. 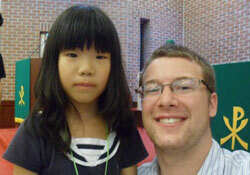 A group of young adults taught English as a second language on a mission trip to Seoul, South Korea. The trip to Korea was a tremendous resource for the school in Seoul, the congregation of St. Paul’s Lutheran Chapel in Iowa City, Iowa, and the communities they serve. This trip also opened the door for one of the participants to enter a formal partnership with the school in Seoul to serve as International Student Ministry Director. A grant was received by young adults at St. Paul's Lutheran Chapel in Iowa City, Iowa. The sections below offer more information regarding Gathering Grants eligibility, deadlines, application advice and more. Who is eligible for a Gathering Grant? Middle and senior high school youth ministries in LCMS congregations or informal groups of youth and adults in LCMS settings (i.e. circuits, districts, etc.). Eligibility requires partnership or collaboration with or in service to youth. Individuals are not eligible for Gathering Grants. What kinds of projects are funded through Gathering Grants? Preference will be given to projects involving youth in the planning and/or implementation of the project, to projects reaching out to un-churched and marginally-churched youth, and/or to projects placing youth in leadership roles. What kinds of projects are NOT funded through Gathering Grants? Do involve youth in the planning and/or implementation of the project. These grants are intended to empower youth to reach their un-churched and marginally-churched peers. Encourage youth to dream of ways to do this. Place them in leadership positions and help cultivate their gifts and abilities. Then, be sure to highlight this in your application! Do (completely) answer all the questions! Duh. This seems like a no-brainer, but grants get Returned-to-Sender all the time because of incomplete answers. Do have someone (skillfully, thoughtfully) proofread and (ruthlessly) edit your grant. If they don't get it, no one else will. Don't use too many words. Cut content. Don't use five words when three will do. Choose every word. "Really" is a really bad word choice. "That" is a word that you (hardly) need to use. "Special" isn't. Do a great job on your budget ... a lot of people skip it or are vague on the dollars. Know how many bucks are needed, where they come from, and where they go. Do think in threes: "Kids need ... 1, 2, 3." "Our program will meet those needs by ... 1, 2, 3." "Your grant will help us ... 1, 2, 3." "The end result is 1,2,3 ..."
Do say the magic word: "Leverage!" This means our money will get you more money. Tell us you have a great project people (with money) believe in. The best way to leverage: the challenge grant. Let's say you need $10,000. Get one person to pledge $5,000; or two to pledge $2,500; or 10, $500; or 20, $250 — you get the picture. Sell them on your project; tell them they're putting up a challenge and they don't pay unless the grant comes through. People love this, (we love this) and your $5,000 Youth Gathering Grant just turned into 10G's! Do come up with your "Elevator Speech." If you can convince others (and yourself) in 3-4 minutes (by the time you reach the seventh floor) your project brings value to the world and God's Kingdom, and you're on your way to making it happen. Don't ask for money for a one time gig or speaker or youth trip or service project or other event that really only benefits your youth group or church kids or friends. Reject. Do say another magic word: "Ongoing!" As in "continuing" or "monthly" or "regular." If your program effectively and creatively meets a need of local kids and/or youth in some new way with a regular, recurring, ongoing program that somehow integrates Jesus' love and life into kids' lives, you're a slam dunk for funding. Do say the REAL magic words: "Thank you!" Report back to us with thanks, success stories, pictures, videos and more thanks. You might just be setting yourself up for another successful grant request! Grant proposals must be submitted online to LCMS Youth Ministry at GatheringGrants.LCMS.org. Submissions are welcome at any time within the three-year cycle. The current grant cycle ends on June 30, 2016. 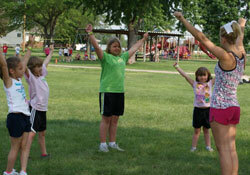 Grants are processed by the Gathering Grant committee within 60 days. If awarded, payment will be made within 30 days of the grant’s approval. In certain cases, the Gathering Grant committee may decide to divide the grant into two payments: an initial payment and a final payment halfway through the project. The minimum grant shall be $250. The average grant is anticipated to be $1,000. No grant will be made for more than $5,000. A grant cannot exceed the amount remaining in the Gathering Offering designated for Gathering Grants. Gathering Grant projects should not exceed two years. Final project reports must be submitted online to LCMS Youth Ministry within 60 days of project end date. Upon awarding a grant, the Gathering Grant committee and grantee will agree upon a report schedule. All reports are submitted online at GatheringGrants.LCMS.org. Reports are required every six months. For example, for a one-year project, a progress report is due six months after the grant is awarded and a final report is due 60 days after the ending date.